Royal St Georges is one of the finest courses in England without doubt. However, just along the road is a course which is arguably even more fun and can more than hold its own with such great company. Royal Cinque Ports (pronounced 'Sink' port, and also known as Deal) is a classic links course which will have you grinning from ear to ear. It's been host to the Open on two occasions and countless top quality amateur tournaments. From the yellow tees it is a pleasant 6.500 yards, par 71 with 3 par 3s, 2 par 5s and an abundance of par 4s. It is a classic out and back course with the first in front of the clubhouse playing to the south before turning along the shore for holes 2-10 (normally with then wind) and then turning into the prevailing breeze for 11-18. Right on the coast, it is probably rare to find Cinque Ports on a calm day and the yardages on the card will only count for so much. The course doesn't have much in the way of views, and in some ways can be slightly bleak as you don't get to see the sea but a large bank which borders the English Channel but it really is good, classic links golf here. There is nothing tricked up about the course but there are some obstacles to navigate such as the burn on 1 and 18 and the greens have some real swales but were in magnificent condition when we played. We arrived quite early for our round and had a lovely couple of drinks and lunch overlooking the course. The balcony on the clubhouse provides a commanding view over the course and channel and you can still see the damage done to the flagpole from aircraft attacks on WW2. This place is steeped in history. It was in this car park that Walter Hagen changed his shoes before the 1920 Open in his chaeffeur driven car having been refused entry to the clubhouse. Things have definitely changed now and the welcome we got was a warm one. The course won't beat you up badly, although the wind could test that, but you will come away with a feeling that you have played a wonderful links course and it is a must play if organising a golf trip to Kent. As I say, we were made to feel very welcome when we played but it is a bit of a logistical pain to play at RCPGC (as they catchily like to be known). If you are playing as a single or 2 balls (whether that is two people playing two balls or four people playing two balls) then you can be accommodated pretty much any day. If, however, you want to play a three or four ball then Mondays and Thursdays appear to be the only option. 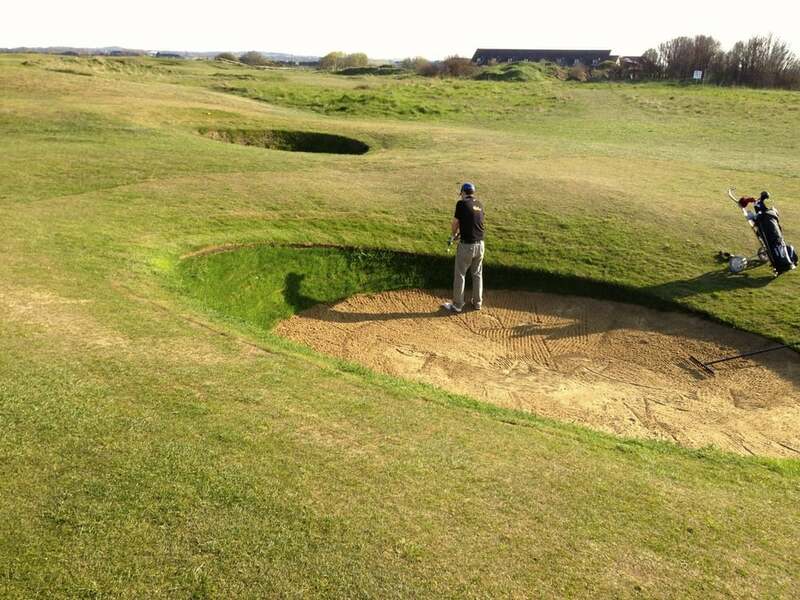 Bear in mind if you are considering a round at St George's as well then fourballs can only do Tuesdays there. If you can manage that then you can book away online here. As noted in the Royal St George's review we stayed at Canterbury and Cinque Ports and St Georges are equidistant from there. We also had a very pleasant night out in the high spot of Margate and Ramsgate is close by too. OK, you're not going to get the most stellar nightlife on this trip but it will be perfectly pleasant and it's quite hard to stay up too late! We played at Royal St Georges and Chart Hills, had Princes not screwed up their booking system we would have played there as well. Maybe next time.